As a newbie in business, I must say that money matters are not my forte.....AT ALL.... However, being with business minded people like my mentor Eryca Freemantle, business associates and generally those who value my skills, talents and worth has helped a lot in developing my mastery of money as a business person. Even though money talk and any reference to wealth is usually directed towards business people, daily habits as a regular individual is also key to living a fulfilled and purposeful life....Shannon Ables agrees with me in this post. Most importantly though, True Wealth is a state of mind. The Nobel Prize winning author and philosopher for the field of literature once said about the topic of money and happiness, “It’s a kind of spiritual snobbery that makes people think they can be happy without money.” And while his acerbic tone is a bit chilling, in our modern world, unless we choose to live an alternative lifestyle, a certain amount of money is necessary to thrive rather than just survive. Now should money be our driving force in life, something to worship? No. What money should be in our lives is understood, regarding the role it plays in our lives. We then must become the masters of money, but to ignore its necessity in our lives is to get in our own way. So today we’re going to take a closer look at the everyday decisions that may appear initially small along with the once or twice in a lifetime decisions that when navigated properly yield a stronger financial foundation. So what exactly is true wealth? 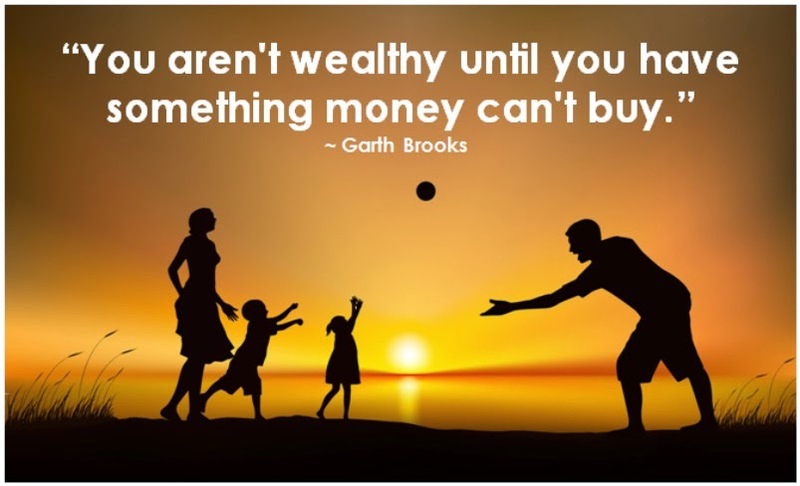 True wealth is a combination of contentment, a sense of purpose, strong, healthy relationships and a bank account to enable you to tend to each effectively. 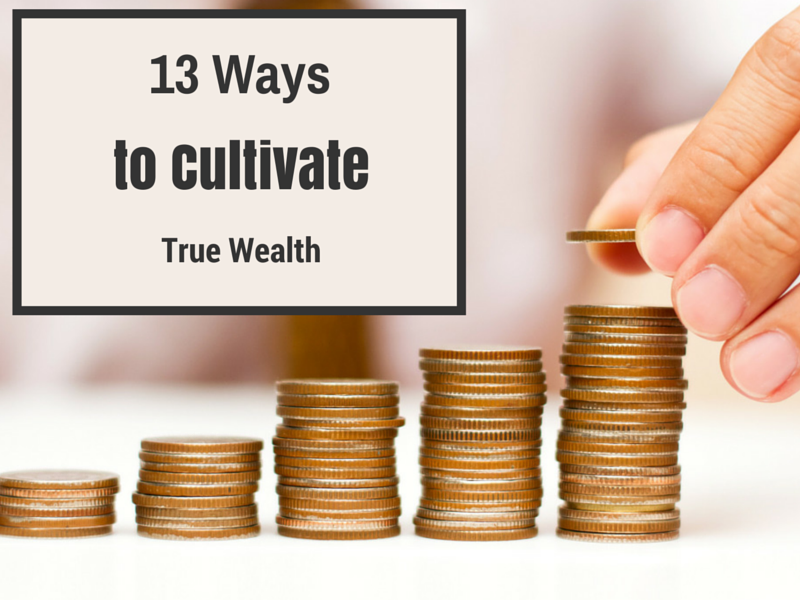 So with that in mind, let’s take a look at the thirteen ways we each can cultivate true wealth in our everyday lives. Financial advisors have three basic principles when it comes to advice about money: (1) spend less, (2) make more and (3) invest wisely. Each one of us will set a different number that is required to live within our means as well as our comfort zone. But the key is to know where your money is going and assess as honestly as possible, whether your money wisely spent or mindlessly wasted? Only you know the answer, and this will change as the years pass based on goals achieved, personal growth and knowledge of how you wish your life to proceed. Recently Forbes reported that in order to acquire more wealth, we must not aspire to live in the best or most expensive neighborhood. Why? Spending an exorbitant amount of money on a mortgage or rent simply to keep up in the present is going to drain our bank accounts of good money that could be invested and enjoyed in the future. If we forgo that enticing address, in time our saved money will yield more financial security and flexibility for decisions down road. When it comes to transportation, if your schedule requires you to drive a car, rather than purchase a new vehicle, invest in a used car and drive it for more than a couple of years. Preferably to the point where you no longer have payments and the car is still in decent condition for trade in when the time arises. When it comes to investing, the best advice is to invest early to allow for compound interest to work for you. Regardless, whenever you begin investing, have patience. Forget about your investment, schedule automatic deposits each month and let time do its work. If you are receiving a tax refund this year, if you receive a bonus at the end of the year, if you received an unexpected commission, set it aside in your savings, mutual fund or wherever you place money that is not readily at your disposal. If you do this each time an nice windfall comes your way, you will establish a very comforting nest egg for a long list of opportunities down the road. You may have invested in Facebook or Twitter when it finally began selling publicly simply because you hoped it would be the next Apple, Google or any one hit wonders that have skyrocketed since they debuted years ago, only to be disappointed. Don’t fall prey to the hype. While you will want to invest in higher risk stocks when you’re younger, look to mutual funds or consult your financial advisor unless you are someone who knows the market very well. On TSLL style is discussed, shared and shopped regularly. And while there is great power in the proper appearance, knowing the difference between building a capsule wardrobe made up of 10-15 qualities items is much different than requiring top labels merely for the fact that you will be seen wearing such items. Tend to your appearance just enough to command respect and exude confidence, but don’t drain your bank account to make a strong first impression. Without question, your talents and intelligence will carry the weight of that requirement for you. At first glance, communication may not be something you’d expect to see on a list dealing with wealth, but when it comes to relationships – professional and personal – it is how you are able to effectively communicate that will land you that job, convey sincerity and express your boundaries, love and aspirations clearly. Dale Carnegie’s well-known book How to Win Friends & Influence People, while written originally in the 1930s is a helpful guide to learning how to converse with just about anybody in any situation and achieve the desired outcome. While intentioned for the professional world, it offers key tips for any relationship you seek to strengthen. In the recent book I recommended last week Food Rules, the author reminds that it is better to pay the grocer now than the pharmacist or doctor later. And while initially paying for quality food items rather than quick, processed food may sound like a waste of money, it is actually a worthwhile investment in your health, your happiness and your bottom line. In order to attain wealth, you must have the knowledge of how the world works. Whether we are talking about the world in general or the world in which you work – rules, expectations, means for gaining that promotion, means for getting fired, you get the idea. And with any law or rule, they are made by man, so they are ripe with imperfections. But in order to change a rule that is ineffective, we must first understand what it is and why it came to be. This takes time and attention, but knowledge is power so that you aren’t left on the sidelines wondering what happened. Choosing to forever be a learner of life, whether it is in a formal setting or as you travel the journey you are currently on is to become agile, nimble and wise to when it is best to progress or hold firm. To know history, to understand current events and how they will affect you, again I will repeat in #11 as I did in #10, knowledge is power. Not power to use to control others, but power to charter the path that will help you to unearth your true contentment. If you are currently involved in a job you love, you may not initially be reaping the benefits; however, if you continue to be diligent in your efforts, spend time becoming an expert on your craft, you will create a niche, a talent, a gift that you can offer others like nobody else can. The key is to persevere and forever be a student, learning something new in your desired field. For if you are happy and hours pass away like seconds, and you have something that others need or desire, you will find a career and you will be successful. Unfortunately, opportunity doesn’t give us a calendar or schedule of when it is to arrive. Which in actuality may be a blessing in disguise. After all, how would it distinguish those who truly desire something from those who are fair-weathered? No opportunity is something we must prepare for out of a sort of blind faith. It is something what we must diligently work for in our desired field, toward a goal that we may not even know how to define, and then, as the quote above suggests, we must begin knocking until a door finally opens. As you can see, some of the ways to acquire wealth deal directly with monetary decisions, while others are indirectly responding to how we interact with life, our health and our willingness to take risk and be true to our talents. Upon attaining true wealth, you will recognize it because you will become less restless, you won’t be counting your money or incessantly checking your accounts, rather you will be able to sit back, breath deeply and remain confident that you have done the proper preparation, are offering something of value and have taken risks when necessary that are in alignment with your goals and values. So you see, true wealth is a state of mind, one that while yes, does involve money to some degree, also requires of the journeywoman to be in tune with themselves and conscious of how they live each and every day.